In the last decade or so, the equine industry has seen a great rise in popularity of the lightweight trail saddle. Many of us scoffed at these saddles when they first arrived on the market because, at that time, lightweight and quality did not really go hand in hand. However, since the late 90’s, technological advances in the trees and overall design of these saddles has greatly improved. In fact, in my opinion, these saddles are the biggest thing to happen to this industry in the last 75 years. I have sold saddles of all kinds for over 30 years. In that time, I have seen a great many makes and models of lightweight saddles … some good, some not so good. So when I decided to add lightweight trail saddles to our line, I chose two well-respected saddle makers whose saddles I thought offered the most to horse and rider: the Flex2 (formerly Flex Lite) Trail Saddles from Circle Y and the entire line of Tucker Saddles. If this sounds like an advertisement, it is. We love these saddles. The Flex-Lite tree first entered the market on Circle Y’s Barrel Racing Saddles. Barrel racers are constantly searching for ways to reduce the weight and increase the performance of their saddles. The Flex-Lite tree design was significantly lighter and its flexibility offered all the weight-distribution benefits of a traditional saddle tree without restricting the horse’s movements as he reached and bent around the barrels. Barrel racers were thrilled. Circle Y recognized the potential this tree had in a trail saddle and designed the line of Flex-Lite Trail Saddles, which has since morphed into the improved Flex2 tree and saddle design. We have sold Circle Y Flex-Lite saddles since they first began in Barrel Saddles. The Flex2 Trail saddle has been a terrific saddle for women, younger riders, riders with back or shoulder problems and anyone else who has a difficult time saddling a horse with a heavy saddle. 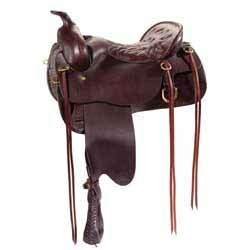 Its overall design and moderately deep seat design make it an excellent all-around western saddle for trail, pleasure and most sports except roping. Because of the tree design, we have also found this saddle to be an excellent saddle for mules with classic mule conformation and mutton withered horses. The 3-way in-skirt rigging gives the rider cinching options to help fit this saddle to multiple animals. Additionally, because of the Softee leather on the seat jockey and fender, there is virtually no breaking in of this saddle and it can minimize the rider’s knee and ankle strain. In the last year, Circle Y has improved and expanded this line of saddles to offer many tooling designs and color options, all with matching tack. Tucker Saddlery has been making trail saddles for almost 25 years. Many of us who have been in this business for a long time were slow to accept these unique saddles as quality pieces of tack that we would not be ashamed to have in our tack rooms. But Tucker Saddles have stood the test of time and have shown themselves to be truly excellent saddles. Tucker uses high quality materials from the leather to the hardware and offers the best warranty in the business on their trees…a full ten years. Tucker uses a wooden tree covered in a sealing material called DURAhide™. They have designed this tree to offer a good fit to many breeds including gaited horses. To do this, they flared the bar ends slightly to open up space for the extra movement of the gaited horses. We have found this design to be beneficial to many other breeds as well by offering a little more room in the shoulders. Tucker designs and builds only trail saddles. 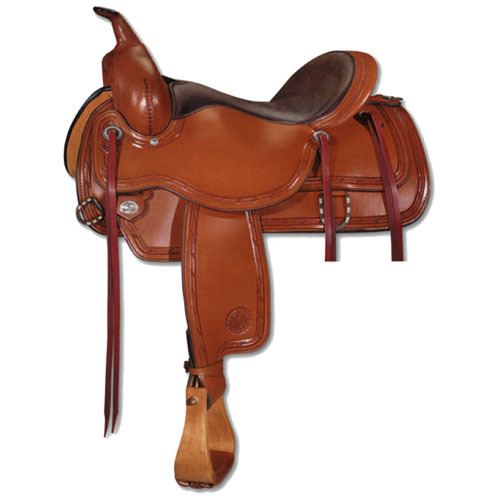 All of the features on these saddles are designed with the needs of the trail horse and trail rider in mind. Of course, the most unique feature on a Tucker is the patented Gel-Cush, shock-absorbing seat. Made with layers of foam and gel, this very well-padded saddle seat makes long rides a joy. Selling Tucker saddles has been nothing but a pleasure. With three tree widths available, there are few horses that Tucker Saddles don’t fit. Like the Circle Y Flex Lite saddle, they have been very popular saddles with women, younger riders, riders with back or shoulder problems and anyone else who has a tough time saddling a horse with a heavy saddle. We have had a few customers who thought that their riding days were over because of injuries or chronic pain. We have had two customers with bad backs call us and tell us that the Gel-Cush seat on the Tucker gave them the ability to ride again in comfort. Another customer was not able to ride for more than an hour because of knee and back pain until she bought the Equitation Endurance. The combination of English stirrup leathers, the Trail Glide Stirrups and the Gel-Cush seat provided her with the comfort she needed to ride for hours. Although it may not be scientific, as a saddle retailer, I think one way to tell the quality of a saddle is to count how many of those saddles come back as trade-ins. In all my years of selling Tucker Saddles and Circle Y Flex2 Trail saddles, I can count on one hand the number of both of these saddles that have come in on trade. These saddles really hold their value and their owners don’t let them go. There is no longer any reason to think that for a saddle to be good quality, it has to weigh 40+ pounds, nor should it ruin your day to saddle your horse. Both Circle Y Flex2 Trail Saddles and Tucker Saddles offer the customer an exceptionally well-made saddle. Both saddle trees are designed to fit a wide range of horses and to not restrict the horse’s movement. Circle Y and Tucker Saddles offer comfort for both horse and rider and are specifically designed for the trail and long rides. And both lines offer the customer many choices of styles, colors, options and more. So you can have it all in a trail saddle!